On September 25th, sadness struck the environmental community. That was the day, last week, when Wangari Maathai passed away at the age of 71. In today's age, 71 isn't all that old, which leads to greater sadness. Who was Wangari Maathai? Beyond being an environmentalist, she was a scientist, a professor, a teacher, a mother, a leader, a social justice/human rights activist, a peacemaker, and a Nobel Peace Laureate (in fact, the 1st black African Woman to do so). Additionally, she was the founder of the Green Belt Movement. Imagine living the life of Wangari: Imagine a former day when your homeland was a beautiful tree-shaded country. Imagine leaving for several years to get your education, then coming back to find your homeland devoid of those lush trees, replaced by wilted & deteriorated plant life, with no shade for the harvest due to the blazing sun. Imagine wanting to do something about it.…then imagine doing it! 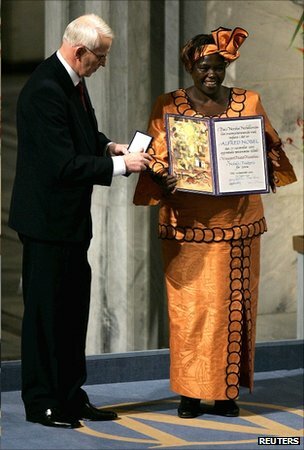 This was the life of 2004’s Nobel Peace Prize winner, Wangari Maathai. On June 5, 1977 on World Environment Day, after being in America for 6 years for schooling, Wangari gave birth to what was to become Kenya’s Green Belt Movement. It all started with the planting of trees, one at a time, along with encouragement to the women of her village. These women began following Wangari’s lead. This symbolic birth of one tree being set into the ground by one woman has become 30,000,000+ trees and many women over time. It brought pride & prosperity to the women of Kenya during a turbulent time of women’s rights in Africa. What a classic example of how one small move can end up resulting in something huge, something that can make a powerful impact. What a classic example of a remarkable lady! !